Residents living near the site of the proposed North Fork SurgiCenter on Boisseau Avenue in Southold say they oppose the project because it would affect their quality of life. During a Southold Planning Board public hearing Monday, two residents expressed concerns about traffic flow. In addition to its agriculture, its bayside beaches and its vineyards, there’s something else that makes the North Fork unique: its shallow supply of fresh water, floating in “bubbles” underground, just above a layer of seawater. When it comes to water conservation, it’s time to start thinking about ways to save. That was the message out of a public forum at Southold Town Hall Tuesday night, where representatives from the Suffolk County Water Authority, Legislator Al Krupski, and members of the Town Board all spoke about the importance of keeping the North Fork’s freshwater supplies safe. Southold Town Supervisor Scott Russell and North Fork Legislator Al Krupski and a representative from the Suffolk County Water Authority will take part in a forum Tuesday night to talk about the importance of water conservation. CARRIE MILLER PHOTO | Newly-purchased fire hydrants may have to be sold for scrap if new federal regulations aren’t changed or put on delay. Stockpiles of fire hydrants previously purchased by local water districts could soon be useless following the enactment of new federal standards for lead used in infrastructure providing drinking water. Effective Jan. 4., the maximum amount of lead allowed for use in pipes distributing drinking water will change from 8 percent to .25 percent – a new standard decided upon by the Environmental Protection Agency. The new standard is a result of the Reduction of Lead in Drinking Water Act passed in Jan. 2011, aimed at reducing the amount of lead in drinking water pipes and other plumbing fixtures to protect public health. Although the act was passed nearly three years ago, the EPA only recently indicated fire hydrants would have to meet the new standard – because they can be used to provide drinking water in emergency situations – according to a release from Sen. Charles Schumer’s office. Any hydrant installed on or after Jan. 4. would need to meet the new EPA standard, according to the guidelines. He said had the agency known three years ago, they would have prepared to comply. They agency was notified Oct. 22., when a summary of the law’s guidelines was released by the EPA, he said. The SCWA services about 1.2 million people annually through over 37,000 hydrants, and services most of Southold Town. The agency’s existing stock of hydrants yet to be used numbers about 400 – valued at about $1,000 apiece – that, combined with associated fittings, totals about $450,000 of what could be unusable equipment, Mr. Gaughran said. If no exemptions are made, or delay is granted by the EPA, the existing stockpile would be sold at scrap value, he said. At a press conference Monday, Mr. Schumer called on the EPA to exempt existing stocks of fire hydrants purchased before the EPA released the guidelines in October, which he says will save water districts thousands of dollars. On Dec. 2, the House of Representatives unanimously passed legislation that would add fire hydrants to the list of devices exempt from the new lead standards – which includes toilets and shower parts. Action from the Senate and Presidential approval would still be needed to fix the problem for local water districts. Mr. Gaughran, who called the problem “just another example of government bureaucracy out of control,” said the agency replaces about 200 of its about 3,700 hydrants each year – many of which become damaged in winter storms and car accidents, he said. While lead is rarely found in source water, it can enter tap water through the corrosion of plumbing materials, according to the EPA. Exposure to lead can affect nearly every system in the body, and exposure above levels of 15 parts per billion can cause in delays in physical and mental development in babies and children, according to the Centers for Disease Control and Prevention. CARRIE MILLER PHOTO | Suffolk County Water Authority assistant superintendent Warren Jensen. In an effort to reduce the impact of chemicals on Long Island’s groundwater, the Suffolk County Water Authority wants to learn more about how North Fork farmers cultivate their land. The public agency has contracted Cornell Cooperative Extension of Suffolk County to gather data from local farmers about their agricultural practices, hoping to better understand if and how the chemicals they use are reaching groundwater. “We want to have a better handle on things like what crops are being grown and what products are being used to grow those crops,” said Carrie Meek Gallagher, chief sustainability officer for the SCWA. A farmer’s irrigation and product storage practices can each play a role in whether or not chemicals are leeching into the groundwater, she said. After gathering the information, Cornell scientists will make recommendations on how farming practices might be improved to protect water quality in the future, Ms. Gallagher said. Dale Moyer, agriculture program director at the county extension said researchers are in the beginning stages of planning the study, which they hope to start sometime early next year. He said there are many materials farmers use that do not make their way into groundwater, so researchers hope to also get a broad understanding of products working well in the area. The program, which will cost about $5,700, will focus on farms surrounding the agency’s well field off Route 48 near Mill Lane in Peconic. The well field, one of 17 overseen by SCWA, has seven individual wells, Ms. Gallagher said. It is one component of a long-term plan the authority is working on to continue supplying North Fork residents with safe drinking water — free of pesticides, herbicides and fertilizers used in agricultural production, according to SCWA officials. This year, SCWA installed a filter known as a granular activated carbon system, at one of the seven wells in the Peconic field. The system, which holds 10,000 pounds of carbon, costs about $750,000, not including maintenance, said Warren Jensen, an assistant superintendent with the agency. Trace amounts of at least five different chemicals commonly used in agriculture had been detected in groundwater at the Peconic site, according to 2012 SCWA data. They include nitrates (nitrogen) and metalaxyl, two of the substances most widely contested by environmental advocates. Many of the pesticides or fertilizers that have been detected in Long Island’s groundwater are what the agency calls legacy contaminants that are no longer available for use on Long Island, Ms. Gallagher said. Some of the detected compounds, however, are still being used in fertilizers and pesticides on Long Island. If SCWA finds the information gathered by Cornell useful, it may extend the program to each of its additional well fields. PHOTO COURTESY SCWA | SCWA employees Carl Pfeifer and Tim Motz at the site of the Cutchogue water main extension. 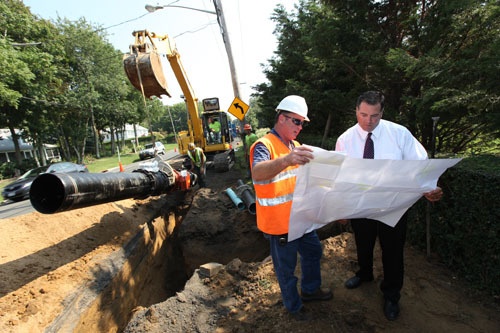 Two water projects connecting 19 households in the Cutchogue-New Suffolk area to the Suffolk County Water Authority system is in the books. The projects, totaling just under $400,000, consisted of one main extension in each hamlet, initially connecting 17 new customers in Cutchogue and a pair in New Suffolk. The Cutchogue project, which cost about $330,000, ran 1,260 feet down Main Road between Moores Lane and Cases Lane. In New Suffolk, 565 feet of pipe was laid on Grathwohl Road. That cost about $65,000. “We’re looking forward to serving new customers on the North Fork and bringing them safe and constantly tested drinking water,” said SCWA Chief Executive Officer Jeff Szabo. Addition to the SCWA system means the customers will no longer need to maintain a well pump, though they will be subject to SCWA prices. The water authority serves about 1.2 million people. Although the heat wave is over, public water usage hit an all-time high of 8,790 gallons per minute in Southold Town Monday morning, a Suffolk County Water Authority spokesperson said. The water authority set a county-wide record on Friday, pumping 533,000 gallons per minute, besting last July’s record of 523,400 gallons per minute. The SCWA, which provides public drinking water to nearly 1.2 million people in Suffolk, said it has a sufficient water supply, but is urging customers to use it prudently. Peak usage hours are between 4 a.m. and 8 a.m. and are primarily due to the widespread use of timed lawn water systems, according to the authority. The Suffolk County Water Authority is an independent public-benefit corporation operating under the authority of New York State. Poquatuck Hall in Orient will be the site for a forum on wastewater issues next month. Environmentalists on the East End are beginning to sound the cry that the septic systems under our backyards could prove to be ticking time bombs for our health and the health of the Peconic Bays. The Orient Association and the East Marion Community Association are throwing their weight into the debate with a forum on wastewater issues Feb. 16 at Poquatuck Hall. Orient resident Venetia Hands, who was active in the effort two years ago to keep the Suffolk County Water Authority from bringing a pipeline to Orient, is helping to organize the forum for the Orient Association. The group has prepared an online survey, which members hope will be filled out by as many North Fork residents as possible, in order to give them a better idea of the state of septic systems here. The survey is available by clicking here. The survey asks basic questions about when people’s houses were built, what kind of wastewater system it has and whether it was ever cleaned. Houses that were built prior to the mid-1970s likely just have cesspools, while more modern houses have a septic tank that holds the solids while liquids drain from there into a precast concrete ring. Architect Glynis Berry, who lives in Orient and works in Riverhead, has started a new non-profit organization called Peconic Green Growth, which is helping the group put together the survey. Peconic Green Growth is looking for communities that would be interested in setting up new, alternative clustered septic systems that have proved effective in reducing nitrogen contamination in environmentally sensitive areas. Those systems haven’t, however, been cost-effective to date. Ms. Berry’s organization has received several grants that they are hoping to use to help communities switch to better septic systems.